The first national championships were organised in College Park on July 7th 1873 and have been held every year since. This was 39 years before the IAAF was established in 1912 and 23 years before the first modern Olympic Games took place in Athens in 1896. The first ever international athletics match took place in Lansdowne Road, Dublin on June 5th 1876. The match took place between Ireland and England with Maurice Davin receiving the honour of the first Irish athlete ever to represent his country in an international athletics meeting. When the IAAF was founded in 1912, one of the 17 founding members was the United Kingdom of Great Britain and Ireland as it was then known. In the IAAF centenary history published in 2012, it is confirmed that the Irish national Championships are the longest running national Championships in the world today. Athletics Ireland is the National Governing Body for track & field, cross country, race walking and road running in Ireland. It is accepted that the organisation was formed in 1873 and adopted the trading name of Athletics Ireland in 1999. 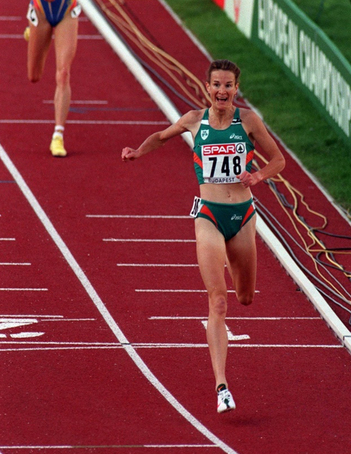 On the track, Ireland had produced numerous World and Olympic champions across all disciplines of the sport and is one of the most active contributors to the sport at international level. Three Irish athletes have received the ultimate honour of being crowned Olympic Champion – Pat O’Callaghan, Bob Tisdell and Ronnie Delany while John Treacy, Eamonn Coghlan, Marcus O’Sullivan, Frank O’Mara, Sonia O’Sullivan, Derval O’Rourke, and Robert Heffernan have all been crowned World Champions. Alongside this numerous Irish athletes have won World and European Championship medals and Ireland has hosted a number of IAAF and European Championship events in track & field and cross country. In 2016 Athletics Ireland had over 58,000 registered members and 340 clubs spread throughout the 32 counties of Ireland.